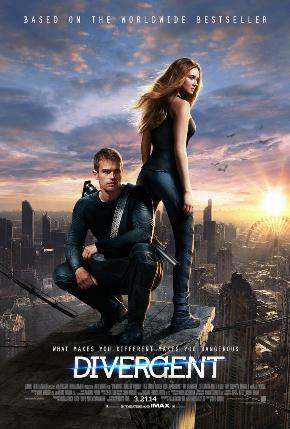 PLOT: In a world divided by factions based on virtues, Tris learns she’s Divergent and won’t fit in. When she discovers a plot to destroy Divergents, Tris and the mysterious Four must find out what makes Divergents dangerous before it’s too late. Future Chicago, the world (or maybe just Chicago, it doesn’t really make that clear) is separated into five factions; the Goody-Goodies, the Brainiacs, the Amish, the Honest and the Jocks. On your 16th birthday you are tested to see which faction you suit best and then you are sent to the sorting hat who chooses which house you belong in (oops, wrong teen fiction). But Beatrice (later know as Triss, which is far cooler) is different, she has traits from three of the factions. This is known as Divergent and it apparently isn’t a good thing. Divergent is your standard run-of-the-mill storyline where a weedy teenage girl rebels against the system she was born into and eventually wins the 74th Hunger Games (oops, wrong teen fiction). There is nothing that you haven’t seen in every other teen-romance-adventure, but we shouldn’t condemn it for that. Star Wars stole most of its themes from Tolkien and that didn’t do it any harm. I haven’t read any of the books that the film is based on, but I don’t lay the blame for the film’s (many) deficiencies on author Veronica Roth. It is surely director Neil Burger who must drop his trousers and take the 30 lashes. The film, at 2 hours and 20 minutes, is at least 30 minutes too long and trundles along at the pace of a stoned caterpillar. The fight sequences (of which there are far too few) are so poorly choreographed they are laughable and Kate Winslet is woefully under-used in her unexpectedly good performance as the wicked witch (oops, you know the drill!). As it is a trilogy of books (predictably set over 4 films, as is the studio greed these days), I would like to think that the movie sequels will correct the wrongs of the first by not having to dwell on a laborious story of what a Divergent is and how Triss saves the world (or just Chicago, I’m still not sure which). The fact that it isn’t directed by Burger can’t do it any harm either! Teen fiction turned into predictable plastic sci-fi.